Here at bearsonline.co.nz, we specialise in Teddy Bear and Soft Toys that everyone loves. All Bears and Toys carry our 100% guarantee to help you shop with confidence. We ship worldwide daily and offer complimentary gift wrapping and card. Please contact us on phone +64 9 459 6070 or email our head bear - michelle@bearsonline.co.nz. Our team at Bears Online have been stocking Teddy Bear and Soft Toys for 17 years now at Gifts on Rathbone our mother store. We're addicted to teddy bear and soft toys and our range has grown so much we decided to add a dedicated Teddy Bear and Toy website in 2013, to share with teddy lovers and collectors worldwide. We would love to help you select the perfect teddy bear or soft toy, perhaps it will become a family heirloom and be passed down through the generations. We can help you search out that special soft toy animal, we're always on the lookout for the latest, cuddliest teddies and toys and can help you with gifts for a Baby, Valentines, Birthdays, Graduations and more. We are locally owned - Whangarei, New Zealand and operated. From left to right - Meera, Jo, Michelle (Head Bear) and Sandra. In front Vanessa and Brittany. Brit holds Meera's favourite teddy - My first teddy. 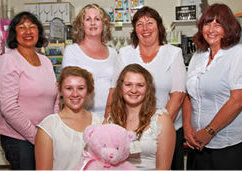 Visit Us Visit us at 10 Rathbone Street, Whangarei, New Zealand. All of our products are available in-store so you can see, feel and touch them for yourself. We are just up from the Post Office and Laurie Hall (Farmers) car park is just 50m down the road. We are open Monday - Saturday for 11 months of the year, then everyday during December until Christmas Day. (Please note we are closed the Sunday after Christmas Day). We are not alone with our love affair of Teddies! President Theodore Roosevelt is responsible for the name Teddy, read how this originated - a man ahead of his time. Gift Wrapping - Complimentary! We will wrap your Teddy or Toy gift beautifully with wrapping to match the occasion, chiffon ribbon and bows and add a hand written card with your personal message. Just let us know the occasion and we will gift wrap accordingly. We can also gift wrap and add gifts for Mum and Dad, Brother or Sister, Grandparents, and more - visit our mother store - Gifts on Rathbone. Lay-by We offer Lay-by with 20% deposit over 3 months. Contact us to set up your lay-by, payable via direct credit or in store.